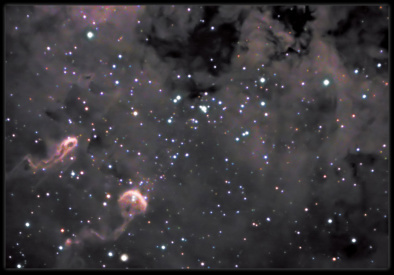 Tadpoles of IC410, a LUM(Ha)/color picture. Exposure time Ha=85min. in 5 and 10min. subs. Dark frame subtraction done and astronomik filter used. The picture was taken with Meade LX200ACF 16" in polar mount on wedge, Optec NextGEN WideField 0.5X reducer and SBIG ST-8XME used. The colors in the picture come from a picture using WO FLT110 and Canon 20Da. This color picture was taken in parallel with the Ha picture. Sub-frames taken 2. and 3. Jan-10.